With over 30 years experience in the dehumidifier market Ebac have poured a lot of knowledge into the 3850e’s features which really shows. The 3850e is one of Ebac’s high performance models and has firmly positioned itself in the market place to compete with other high performance, domestic models produced by EcoAir and Meaco such as the DC202 and 20L. Measuring 50.2cm high by 32.5cm wide by 27.5cm deep and weighing 13kg the 3850e is on the slightly larger and heavier end of refrigerant dehumidifiers. But this is only because it is a real powerhouse of a unit capable of exceptional performance and efficiency. It can be moved by a handle located at the top back of the unit. It would have been nice if this was a folding handle on the top to allow for easier gripping – but it still does the job. You can also fit castors to the base of the unit to allow for easy wheeling in between rooms, these are sadly not supplied with the unit but can easily be bought separately if you need them. Featuring a front, top mounted control panel the 3850e provides all of the controls we’d expect for a top end humidifier and even a couple we wouldn’t! 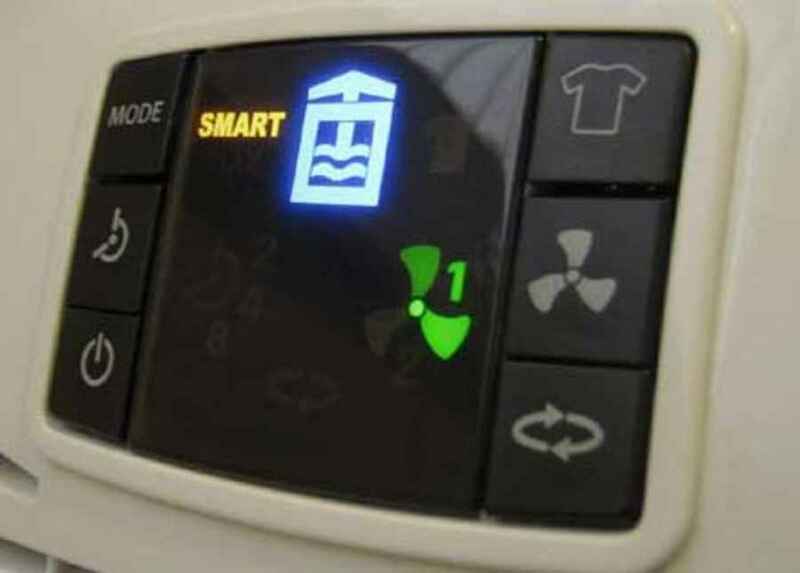 The panel features an easy to use push button system and warm glowing icons indicate what setting the unit is currently running in. In the top left hand side of the panel you will find the ‘Mode’ button. 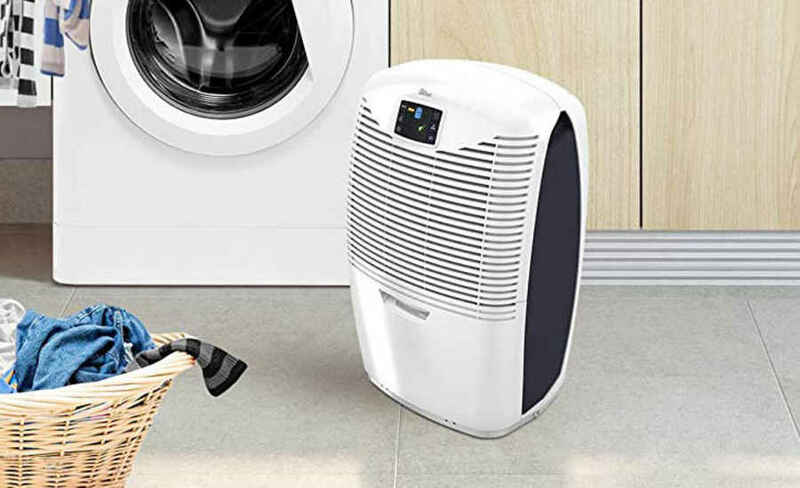 It features two settings, which is more than enough for this device because it packs some impressively smart technology that makes it not only efficient, but also very cost effective. The two modes available are ‘Smart’ and ‘Max’. Looking at the ‘max’ mode to begin with, it is analogous to the ‘continuous operation’ or ‘laundry mode’ (although there is a laundry mode on this device. It is slightly different to the norm – more on this later) found on other models. 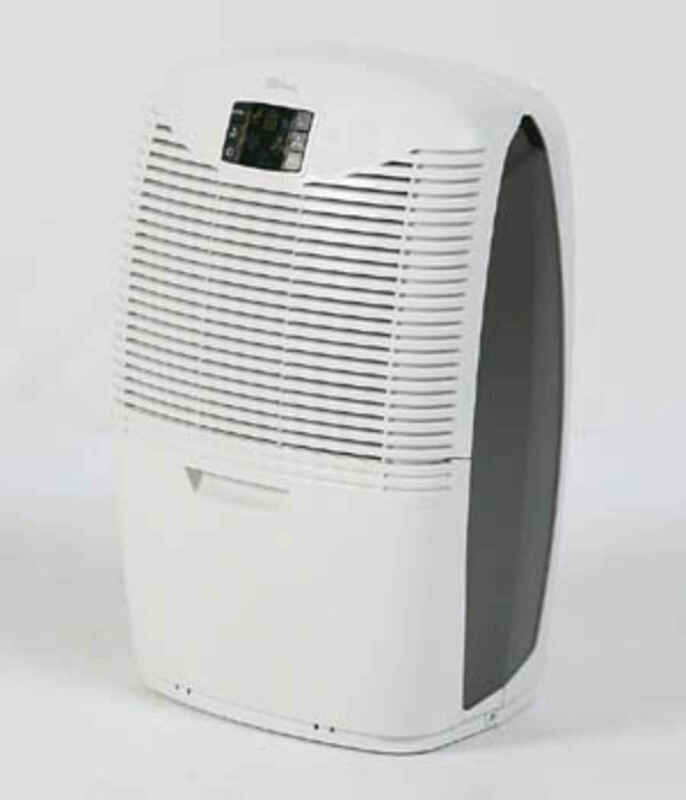 In max mode the unit will run continuously at the highest fan speed and setting to draw as much moisture from the surrounding environment as quickly as possible. This is the setting we would only really using to tackle severe damp quickly or to dry your bathroom after taking a long hot shower. Whilst Ebac does not warn against using this setting continuously we would recommend not using it for everyday use because the continuous operation in the highest mode is known to place a strain on all dehumidifiers when used often and may shorten its lifespan. SMART technology monitors your home, keeping an eye on the times when the most moisture is likely to be produced. This can be anything from making cups of tea to when most people shower or are in the home. Whilst it does not know this things are taking place specifically (IE the unit does not know you are making tea!) it does recognize that at the times these activities are taking place there is more moisture in your home. This allows the dehumidifier to collect data on these events and times to plan and act accordingly – allowing it to learn when it should work and, most importantly, when it should not. This makes it incredibly cost effective to run over the usual humidistat controlled units that simply power up every 30 minutes to test the air blindly before turning on or switching off again. A very clever application of modern technology. Moving around the panel you’ll come across some more standard controls such as the timer button. The timer button runs in increments of 2, 4 and 8 hours. Each of which can be selected by toggling the timer button. The timer will only work on ‘max’ and ‘laundry’ modes because the SMART setting is so cost effective to run it does not need to be controlled by the timer. You can control how long ‘laundry’ mode runs – particularly helpful if you’re going out for the day because you can leave the unit to dry your washing without costing a small fortune. If you washing is not yet dry after the running time selected has elapsed the SMART mode should help finish off the drying process. Rather then leaving your washing damp. Next up is the fan speed button. Fan speed gives you bursts of power when you need it, but more importantly it plays a role in just how quiet the machine is. Now, the 3850e is a refrigerant/compressor dehumidifier so it will always be a more noisy than it’s desiccant counterparts but by running on low speed the machine can operate as quiet as 44dB. This is about average for most dehumidifiers of this type, but given that this is a powerhouse we would have expected it to be around the 47dB mark. Placed in a hallway or landing it will still be very effective and the moderate hum it produces will barely be noticeable. Last on the right hand side of the panel is the air purification mode. This stops the unit from extracting moisture and causes the unit to act as an air filtration system. This will a little bit of a puzzle to use because most other units (which have filter systems) allow for air filtration to happen whilst the unit is extracting moisture. So it is a shame this is not the case on the 3850e. Finally we go back to the left hand side of the panel to look at the power button. This is only really worth mentioning because it does not switch the unit off but rather puts it into standby mode. Fortunately a large glowing icon, in the shape of the Ebac logo, mounted in the center of the control panel easily indicates the machines state. It will glow a warm orange when the unit is standby and a vibrant blue when operating. 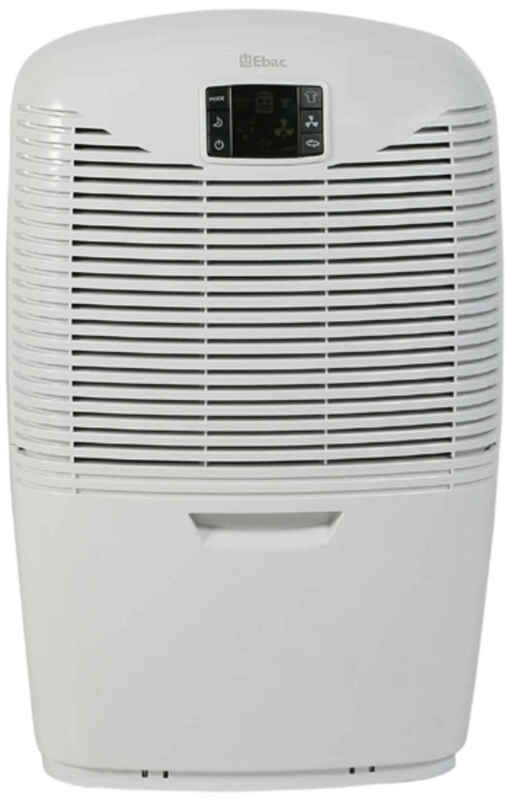 One of the most interesting things about the 3850e, and any dehumidifier made by Ebac, is that they are designed and built to deal with the British climate. This makes them more effective than their counterparts built overseas. It also means that the quoted maximum extraction rate (in litres per day) is a figure you can rely upon and is not overstated because it has been tested in temperatures and humidity levels never really experienced in the UK. And this unit does provide some impressive collection figures and can pull in up to 21 litres of water in a single day. This makes the unit powerful enough to work in homes of up to 4-5 bedrooms. On average that means is can effectively dehumidify an area of around 210m², 420m³. The water tank is located on the front of the device behind an easy to open flap. Our only criticism here is that there is no water level window on the tank to indicate just how full it is. It is nice to quickly see how full the thank is at a glance so you can, for example, empty it before you go out. This will help make sure the dehumidifier keeps running while you are out and does not stop because the tank is full. The tank itself is a very sturdy jerry-can style shape and has a secure, easy to grip, top-mounted handle and can hold a very impressive 3.5 litres of water before being emptied. This is about the maximum capacity available in the domestic dehumidifier market. There is a continuous drainage option on this device and this will allow the unit to run independently of the tank and not need emptying. A rubber bung can be removed from the back of the device and a hose attached. The water can then be safely drained from the hose into your sink. One thing that surprised us here is that Ebac have not supplied the hose – a common addition to virtually all continuous drainage featured devices. Like every refrigerant model the 3850e cannot operate down to the low temperatures that a desiccant model can, however this unit can stay operating down to very respectable 3°C before it becomes ineffective. Ebac have also packed an intelligent defrost system into the unit to help combat the decreased efficiency of refrigerant models in lower temperatures. It will anticipate when the unit may begin to freeze up and stop the unit from extracting water, this gives the coils (the part inside the machine which condenses and collects the water) time to defrost. This ultimately makes the unit much more cost effective to run because it won’t operate when its efficiency might be hampered. There are a few items that Ebac have not included that we would have expected such as the castors and continuous drainage hose. But we suspect these were not included to keep the cost of this unit as low as possible to make it extremely competitive when compared to its closest rival the DC202. And, Ebac have certainly succeeded here, because at the time of writing, the 3850e is around £60 cheaper than the DC202. Overall the 3850e provides fantastic value for money. Its high end performance and very reasonable price tag make this unit ideal for any home that is looking for a great value device that can be left to do its job and is cost effective to run.